Here at Mission: Cure, we strive to bring the patients’ voices to the forefront of our work. Our mission is to cure chronic and recurrent acute pancreatitis by using an innovative financing model to incentivize research and development. We are asking for you, patients and caregivers, to take a couple of minutes to fill out our patient survey. We believe that the needs and perspectives of you – someone who lives with pancreatitis – should be placed at the center of finding cures. We want researchers to know what improvements you most want to see so that they can identify the most appropriate treatment targets. We want drug developers to know what has not yet been addressed so they can prioritize future decision making. We want the Food and Drug Administration (FDA) to know how you evaluate risks and benefits so drug regulation and approval can be aligned with your preferences. We want to bring your input into every aspect of the drug development and evaluation process, so drugs that will address your needs can be brought to you faster. Our patient survey aims to provide us with a better understanding of the challenges that you want us to focus on and to lay the groundwork for us to better connect and mobilize the patient community. 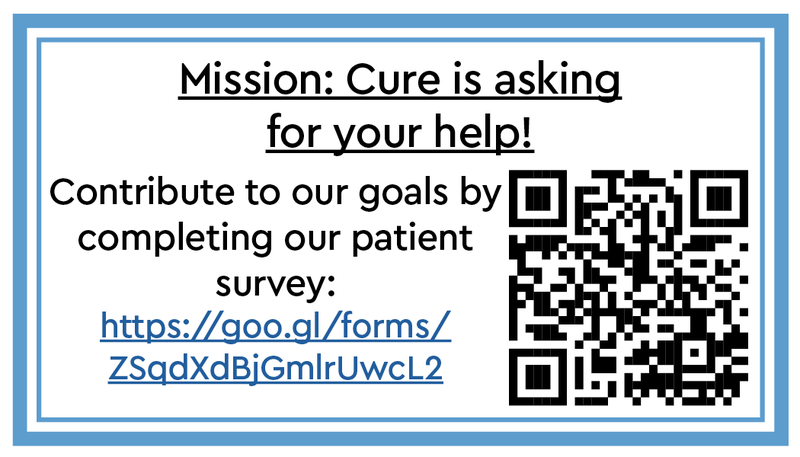 Mission: Cure is starting this effort with our first patient survey, today. This short survey should only take about 10 minutes to complete and will provide valuable primary information for our future efforts to collect comprehensive patient experience data. We would really appreciate it if you could take a few moments to complete the survey, and share it with others who can also contribute.